FMF’s Turbine Core II Silencer is a slip on that combines excellent power increases with unrestrictive spark arresting to produce one of the most popular and best performing optiions for riding on the track or trail. FMF starts the Turbine Core II with an aluminum alloy canister, stainless end cap, and stainless midpipe that give the silencer an excellent amount of durability and quality. Inside the body is FMF’s exclusive Turbine Dampening System, a spark arresting design that doesn't restrict exhaust flow, but still manages to stay 100% USFS approved. And at the same time, the unrestrictive nature of the Turbine Core means it won't just maintain your bike's power, it will actually refine it and let your engine breath better. And that makes the Turbine Core II perfect for all types of riding whether it's hard enduro or fast-paced track riding. I purchased this pipe to become legal with the Forrest Service. The bolt on spark arrestors were not much cheaper so I went with the full pipe. Works great and the pipe sounds awesome, makes my bike sound better for sure. The fit was a little tricky. I understand it is an after market part so there is some wiggle room but it does move my exhaust a little bit due to alignment and the exhaust where it enters the engine is ever so slightly tweaked but does not seam to matter. I am just OCD about that stuff. Overall this pipe is awesome. Put this on a 1989 CR250R project bike I was rebuilding and it made her purr. Thanks. Awesome pipe for safety in the forests. Have this silencer for my KTM 150 as it is forestry approved for trail riding. Decided to also get it for my wife's TC85 And couldn't be happier. I was a little skeptical that the size would look wonky on the 85, but it's just a few inches longer and not too protruding. Installation is super simple and pretty much "plug and play"
The silencer didn't come with mounting hardware but a call to FMF and they shipped out the hardware quickly. 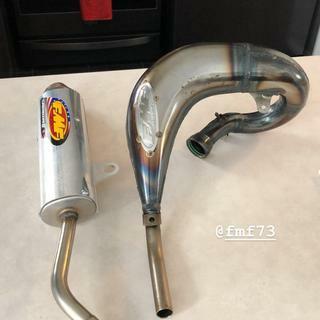 Nice addition to the FMF Gnarly pipe! Had to get a silencer with a spark arrestor. Chose this one along with the gnarly head pipe. I've had good luck with FMF products so I stayed in my comfort zone for this purchase. 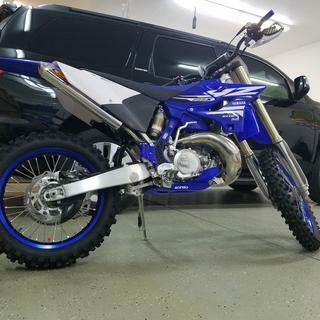 After riding with this setup for the first time my YZ ran great, power was very responsive and linear. Installation was a breeze, it performs and looks great! Woke the bike up a bit. The installation wasn’t as easy as it has been in the past. Took some tweaking to get it lined up correctly. Overall, great pipe at a good price. Bolts right up looks way better than stock and sounds great. I got this for when i ride in areas such as Colorado that require a spark arrestor. I researched and talked with so many people about just putting an end cap on my OEM pipe but apparently they clog and wish they would have bought this pipe. I put 20 hard hours on it in the mountains with zero issues. Installation was a breeze. Looks and sounds great. Added more noticeable low end. I would recommend this product. For the price I paid and the easiness of installation, it was definitely worth it. And it has worked great so far. The exhaust was shipped fast it look good and fit good. The customer service was very helpful and easy to work with. I bought two,1 for my bike & 1 for my boy. Very easy to install, reused the bolts and rubber from old silencer it was a little tight but not an issue at all. Well made looks great and it's a USFS approved spark arrestor. This silencer was super easy to install and it looks great. It gives the bike a lower tone and meets USFS requirements to have a spark arrestor. Highly recommend. Saves a little weight, seems to add a little bit on the bottom end but mostly needed the silencer to be able to ride on government trails. Also, looks great ! Looks great sounds great. I did not check the spark plug yet to see if I need to change jet. Seems to run same as it did with stock pipe. Slapped this badboy on my old 300 EXC and it immediately went into beast mode. My top end is a little more noticeable and it has the bottom end of a John Deere. Quieter, throatier... 5 stars all day this will make you super stoked. I think this is my 4th turbinecore, bike sounds great with no loss in performance. Forestry approved and 10$ to repack. Fit was just as good as stock. Sound is more mellow than stock and it’s USF approved. Looks great sounds better. Made a huge difference on my power and and sounds great. I liked the performance of this silencer,i gave it 4 stars because i don't like packing silencers,its noisy when the packing wears out,so buy a extra packing with it and keep our riding areas open! Great sound, SA, good looks. Needed a USFS spark arrestor, didn't want to go the end cap route. Very glad I didn't. TC2 looks great, seems well built, and tucks away nicely. The install took 5 minutes. Sound was very close to stock. Only reason for 4 stars on durability is it's my first TC2 and I've only had it on a month. I bought this silencer soI would have a trail legal system (spark arrestor). Very happy with it's installation, performance and sound. Seems to give the bike a little more torque over the stock silencer. I run it with an FMF gnarly pipe. I had to replace the stock pipe on my Husky two stroke to get a spark arrester. If it were up to me I would run the stock pipe over this. The stock pipe is a little quieter and if you ask me has a better sound. Next time I will try the new turbinecore 2.1. Obviously a big name in exhaust. I only bought it cuz I smashed my stock one. Frustrating that the stickers ALWAYS fall off after a few rides and washes, and FMF never answers my requests for new stickers. I have bought several of these thru the years and they have worked great. 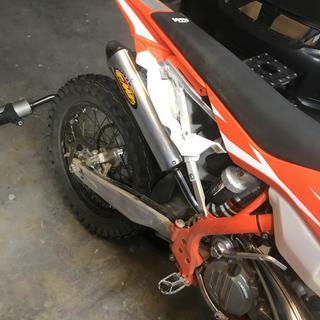 As far as durability I have crashed a few times and the tip cap got bent and loose and the pipe stem bent with my subframe but it is strong, I just crashed really hard I think. My go to silencer because it fits well and is spark arrestor legal for all the races that require one. Swapped this silencer out for the stock one and it opened up my bike a bit. A huge sound improvement over my stock silencer and it looks great too! It feels a little lighter as well. I used Q Stealth for 8 years on my 300exc till it fell apart. Replaced it with the Turbine Core II. Lost some bottom end and gained some top end. Sorry I didn't buy the Q Stealth. Worked well, no real performance improvements. I did have to repack this much sooner than expected (super loud). Stock muffler had twice the hours on it and I have yet to repack it. Fits nicely awesome support team got the wrong one at first and situation was correctly quickly and accurately thanks guys! 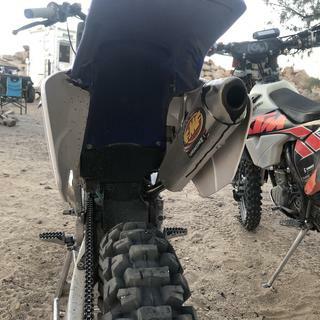 Riding in the National Forest you are required to have a spark arrestor so this is a good buy vs spending almost 100 bucks just for an end cap spark arrestor. Really didn't notice much performance loss/gain and did not re-jet the bike. Installation was super easy. Only got the end pipe and still added bottom end power to my bike. Was looking for an easy way to add a spark arrestor to my bike. Looks good and is smaller than stock. Sounds nice to. This is a great option for your 2 stroke woods bike. Looks good, mounted easily. Sounds excellent. There was a nick in the sticker from the handling when I received it, but I'm sure it will get scratched anyway through riding so it didn't really bother me. Needed a spark arrestor and was looking for something a little smaller then the stock pipe. This checked both those boxes for me. This silencer is quieter than the stock or the shorty silencer I used before. I have ridden with it once at elevations of 8-11k feet...coming from 5k, so I had to change my jetting. I wasn't disappointed with the power delivery, my 125 screamed up steep, rocky hills. I would have not bought this if it weren't required by USFS, but I am not disappointed. Silencer works great. I noticed a power gain immediately, but perhaps because the spark arrestor on the stock one was plugged up, so I'm happy this one doesn't require cleaning. Does the muffler come with mounting grommets? BEST ANSWER: Not for the YZ250x you have to remove the ones from your stock silencer or buy new one.. Use a lube to remove them. Look closely and you will see one end of the grommet is smaller, Work that end out first. No. And it has two mounting holes unlike the shorty with one. You will also need high temp silicone and contact cleaner. Don't think so, I believe I used the ones I had from previous silencer. Grommets were not included with the silencer, but the ones off of your silencer that's on the bike will fit. Mine did not. I had to remove them from my stock muffler, but those worked fine. yes,it does come with rubber and aluminum grommets. No, need to re use the factory ones. 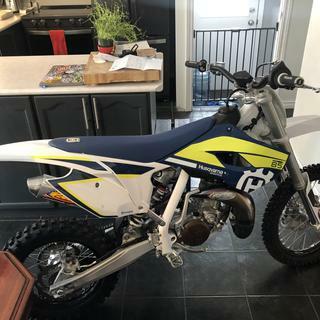 Will this make my kx 125 quieter? I think it’s pretty comparible to the stock sound. 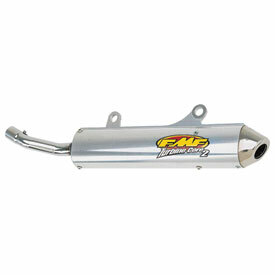 BEST ANSWER: Yes, FMF packs the muffler during assembly so it's ready to be installed. Does it actually have USFS approved stamped on it? Or say "Spark Arrestor" anywhere on the body? Worried about the goons just seeing no screen and ticketing me for it. BEST ANSWER: Yes, it does have US Forest Service stamped on the right side of it, that is behind the number plate on my Suzuki. The FMF design does not use a screen but it does have a internal device that captures the sparks. My understanding is that the officer will will stick a rod into your silencer to see if it goes straight through and in this case it won't. Either way it is stamped into the aluminum body of the silencer. Yes mine has both, as well as an approval number stamped on the side of it. Typically though most the F. Srv. LEO's will either look down the end or shove the antennae of their walkie talkie down the exhaust to make certain they have not been drilled out or had the baffles removed. Yes, mine has a stamp that says US Forrest Service approved. It is on the back side of the pipe and not the easiest to see but it is there. Also if you stick anything in the pipe you will quickly feel the spark arrestor cone. No stamp, but you can see the "turbine core" down inside. It would take a prick to cite you. I will say print out the FMF specs to have with you, definitely overkill but couldn’t hurt. Yes, it has USFS approved stamped on it. This was the only reason I needed this slip on and bought it to ride in the woods. Yes, USFS Approval is STAMPED on the side. Yes, it has been approved and us stamped. Yes it is approved and stamped for USFS. Do these fit the banshee SST pipes? I'm not sure if FMF makes the turbine core for the banshee; however, I would say its very likely. BEST ANSWER: Yes its a quiet silencer,just keep up maintenace on the packing. Yes to a degree it will make it quieter. Will I need to re-jet my 1998 Kawasaki KX80? I would check with FMF directly. They always help! It is suitable for KTM EXC 300 TPI 2018? It is the same exhaust of a 2015? BEST ANSWER: We have these for that machine. But the 2015 exhaust is different. 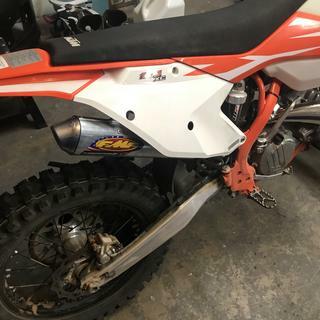 will this fit a 2005 ktm 85 sx using stock exhaust pipe and this silencer/spark? thank you. BEST ANSWER: Yes, this will fit your machine. Please enter in your machine in the drop down boxes above the product image. 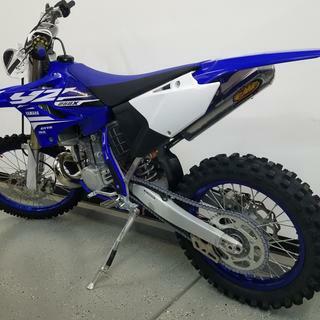 I have a 1994 kx 125 will this fit it? 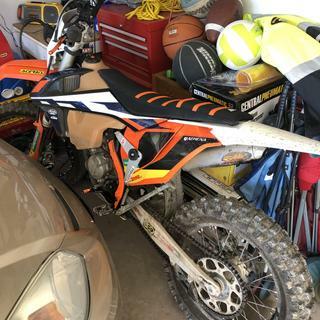 Will this fit a 2016 ktm 65sx?